Mushroom lentil burgers are a great way to use up leftovers. A few mushrooms, some lentils, a bit of onion and a few more ingredients and a star recipe is born! I have made a few other burgers (see this veggie burger and this healthy turkey burger), but these are by far my favorite vegetarian ones. I love the nuttiness the walnuts provide and the creaminess the mushrooms plus smashed lentils provides. You can change up the flavors to make a greek version (think feta and spinach) or even a Middle Eastern version (a few chickpeas and some parsley). However you flavor these burgers, make sure you flavor them well. The next time I make these I will add even more spices to give them a kick. Clean and chop mushrooms to a small size. Heat olive oil in a large pot over medium heat. Add the onion and cook over medium heat for 10 minutes. Add the mushrooms and cook for another 10 minutes until the mushrooms have reduced and the onion is translucent. Add the lentils and water, bring to a boil and immediately reduce to a simmer for 30 minutes. Remove from heat and let cool for 5 minutes. Pour the mixture into a large mixing bowl. Add a dash of kosher salt, paprika, hot red pepper and cumin. Add the egg and bread crumbs, and combine using a potato masher. Mash the lentils until about half are completely mashed and half are still intact. Slowly add the flour until the lentil mixture is not too wet. Add the walnuts and sundried tomatoes and stir to combine. Using your hands, form a small portion of the mixture into a patty. Repeat until you have used all of the mixture. Heat a skillet to medium high and spray some oil on it. Working in batches, add a few burgers and flip after 4 minutes. When other side has crisped up remove and repeat. Serve like a burger with slices of avocado, tomato, and/or hummus. Enjoy! Mmm, these look great, also! another good one to add to my menu while another vegetarian is in our house! 🙂 Thanks for all the wonderful inspiration! Great recipe! 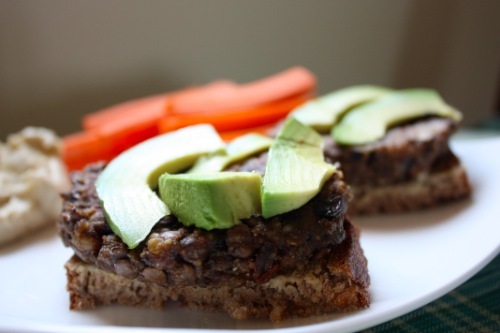 I love lentils and am always looking for creative new twists on veggie burgers. Looks fabulous!! And I am really upset because Lori just finished off the lentils tonight for her boyfriend, ugh. I am book marking this recipe!! Perfect summer meal! Oooh, I’ve actually never made vegetarian burgers before, but these look great. I love lentils and mushrooms! I love all these lentil recipes you’re featuring! These look amazing, as usual. @Tricia Kuchler, Some places sell them in the bulk bins. Others sell them in bags. They are usually near the canned beans if they are not in the bulk beans. 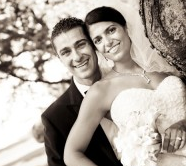 Those looks wonderful…thanks for sharing! 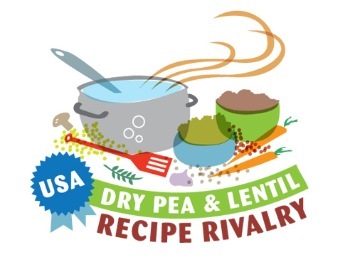 I have to say, I think it’s hysterical that there is a “rivalry” between split peas and lentils. If only all conflicts could be so innocuous! I never thought mushrooms could be such a great burguer base! Is it weird that I think burgers made of meat are lowest on my list of face burgers? I love veggie burgers, thanks for the recipe. Wow. I just made these with extra spices (yay, turmeric!) and canned lentils, and YUM! Great recipe, Sabrina! @S @ extremebalance.net/blog, Thank you so much! Looks delicious! Love those gorgeous slices of avocado on top! i’ve looked at this recipe SEVERAL times since you first posted it – today during my lunch break, I picked up some lentils…i’m eating meat-free this month, and recently read about lentils being a complete protein while doing some research on how to best eat vegetarian/what i should pay attention to when looking for proteins, etc. I came over to look at this recipe after Heather raved about it. I have some lentils hanging out in my cabinet but I haven’t known what to do with them. Thanks for this recipe! I’m excited to try it! It is actually a nice and useful piece of information. I am satisfied that you just shared this helpful information with us. Please keep us up to date like this. Thank you for sharing. These burgers are so tasty! I’ve had a hard time finding vegetarian burger recipes that I enjoy but these are it! My husband loved them and took them to work for a friend of his to try and he really enjoyed them also and asked for the link to the recipe. Amazing 😀 Thanks for sharing!